Kamille and Moses met during a night out with friends in Chicago’s south loop neighborhood. After some conversation, they found they had many similar interests, and Moses walked her out to the car at the end of the night and asked for her number. Their first date was on Halloween weekend at a costume party, and Kamille thought she might not be getting a second date. Moses found her charming! They’d been dating for 3 years, and he proposed in December of 2016 right before the Holidays. 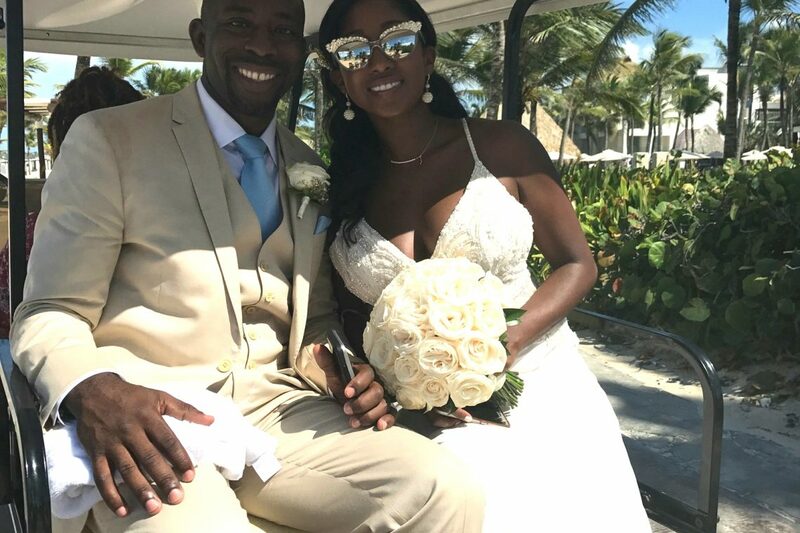 The couple loves to travel and ever since Kamille was a child, she knew she wanted a destination wedding. It was an easy decision. They found out about Hard Rock Resorts by chance during a previous trip to Cancun, where another couple raved about the brand while on a hotel shuttle and it stuck with them. After going back and forth on different resorts, they found Brandi, of Destify, from Hard Rock’s list of certified wedding specialists. With Brandi, they finally landed on Hard Rock Punta Cana. Kamille had decided that the Dominican Republic represented the same attitude and vibes they share as a couple, laid back and fun. Plus the beautiful crystal clear Caribbean waters made it the perfect place. Kamille loved the personalized website Brandi created for her and Moses. She wanted an elegant wedding website and knew this was the right fit. “Once everyone had the website link we got so many compliments! Everyone asked how we did it.” After the website was up and running, Kamille started working with Ana, her wedding coordinator. She picked and chose from all of Hard Rock’s packages and vendors using elements from each package to create her unique ceremony and reception. Every day of their wedding had fun events planned. Many of their guests arrived Thursday evening, and they had an impromptu gathering on Hard Rock’s beautiful terrace. Friday they had an official pool day where everyone could have fun in the sun, socialize, and take pictures and video. Later that evening they booked a gazebo for a welcome cocktail party since all of their guests were now there. The event featured appetizers and signature drinks the couple had chosen. Kamille said, “Make sure your guests have fun. This could be their one trip for the year. So make sure it’s worth it.” Some of the events were compliments of the hotel due to hosting such a large group! They had their wedding ceremony at 1pm Saturday on the beach. For the hot day, they planned ahead and had cooling towels, ice cold water, and even a wedding program that served as a fan for their 60 guests. Afterward, there was a cocktail hour and dinner reception until 9pm where they even had their own DJ from home. On Sunday Moses booked a private booze cruise for family and friends that stopped for everyone to go snorkeling. All of this was possible thanks to the benefits of an all-inclusive resort. In reflection, Kamille laughs about having to put together the welcome bags she made for all of her guests, which she had decided to give out personally. For future brides she recommends having the bags given out by the hotel, a service many will provide. Looking back she wishes she would have one more planned extra day, where everybody could just be together for longer. It was perfect. So many people told me it was the best wedding they had been to.